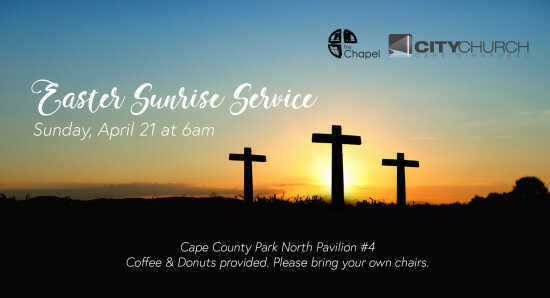 Join us for an Easter Sunrise Service to celebrate that Jesus is alive! This year's service will be held at Cape County Park North (shelter #4) beginning at 6:00 a.m.
Bring a lawn chair (and blankets if it's cool) and stay for coffee and donuts afterwards. Hosted by Cape Bible Chapel and City Church. In the event of rain or frigid temperatures, please check event page for possibility of cancellation.